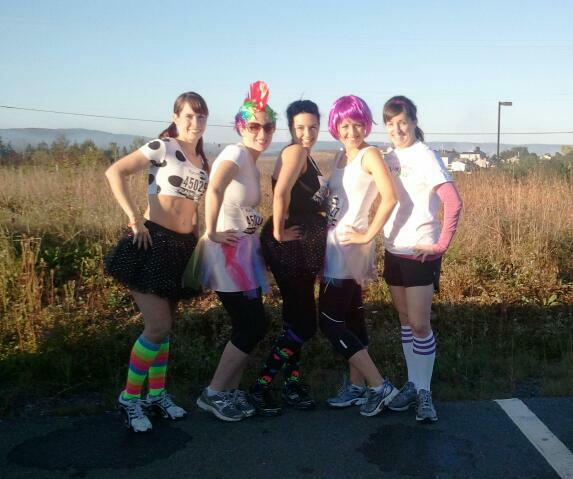 A group of girlfriends and I had dragged ourselves out of bed, threw on some fun, colour-themed costumes and met up with our Halifax-based friend Katie to take part in Run or Dye. It was in Windsor, Nova Scotia, on the other side of the Bay of Fundy in the Annapolis Valley. We had driven more than four hours the night prior (after a very full day at work). We were tired. We should have known after we heard there were between 5,000 and 7,000 participants to expect traffic jams around the single-lane backroads leading to Ski Martok. As soon as we left the main highway, the line of cars was several kilometres long. We started to worry we would be late (and worse, run out of gas). But our mighty and mohawked driver, Jen, got us to our destination with time to spare. The only problem was we lost Katie, who was in another vehicle with her work buddies, along the way. By about 10 a.m., we walked a short trail to the starting corral. Colourful powder was everywhere. 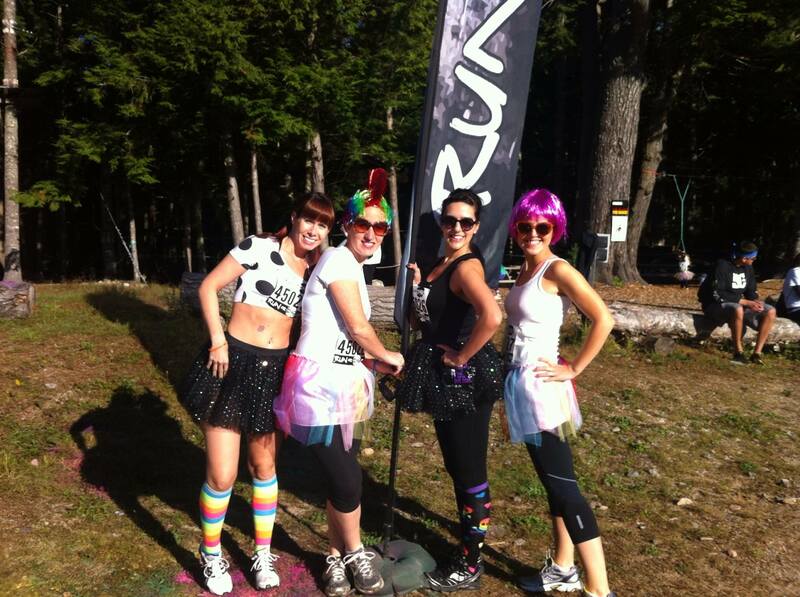 Tutus abound. Very energetic DJ-type guys were in a tall stand at the starting line. They did their best to hype up the crowd, throwing more colour on runners who might already have been buzzing from free Red Bull that was provided in our race packs. They released packs of tie-dyed runners in groups of 50 or so. Finally it was our turn to run. With all the pent-up anticipation, we were ready to rip. But the trail was muddy, narrow and full of walkers. It was hilly and difficult to navigate. Our pack of four stuck together not too worried about our pace – the event was not timed. 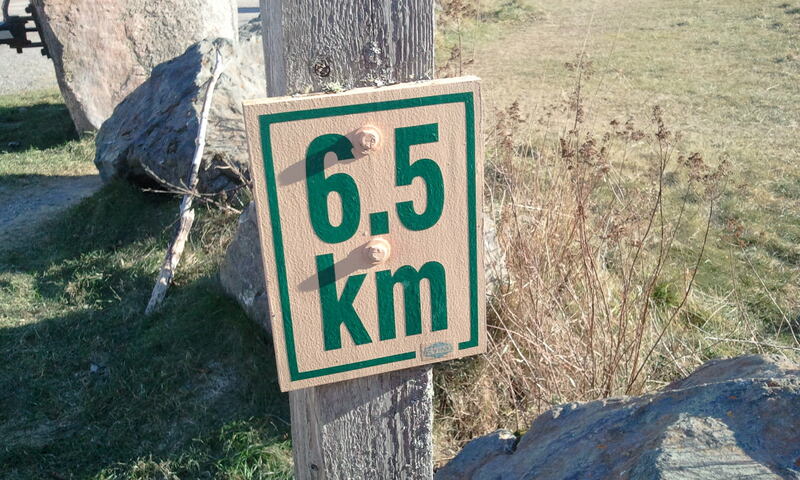 Several colour stations were situated throughout the trail. Bursts of yellow, green and purple popped through the morning air. It got kind of addictive. It made you want more and more colour – on your face! on your arms! on your clothes! Give me more! And yes, the wig did stay on over my mop of hair. 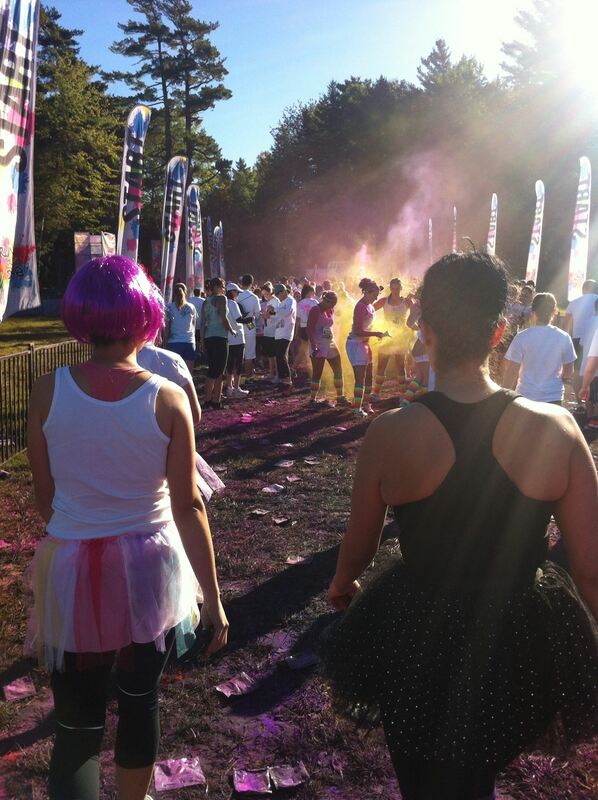 Before long, we had made it the end of what felt more like an obstacle course than a race. Someone said the 5K trail was actually 3.8K. It definitely felt short. Scores of colourful runner were hanging out on a big lawn after the race. A stage was set up with a DJ pumping up another crowd. We took in the sights, grabbed some more fun photos, and headed out for Halifax. The traffic wasn’t as bad on the way out. It also helped that we found a short-cut down another back road. We were happy to get an early check-in at our Halifax hotel. We were not as happy about how much scrubbing was required to get the gunk off our skin. Yesterday I was still finding purple bits on my q-tips. But we managed to get ourselves presentable again, and head out for a night on the town to celebrate Amy’s birthday. We also reconnected with our friend Katie. 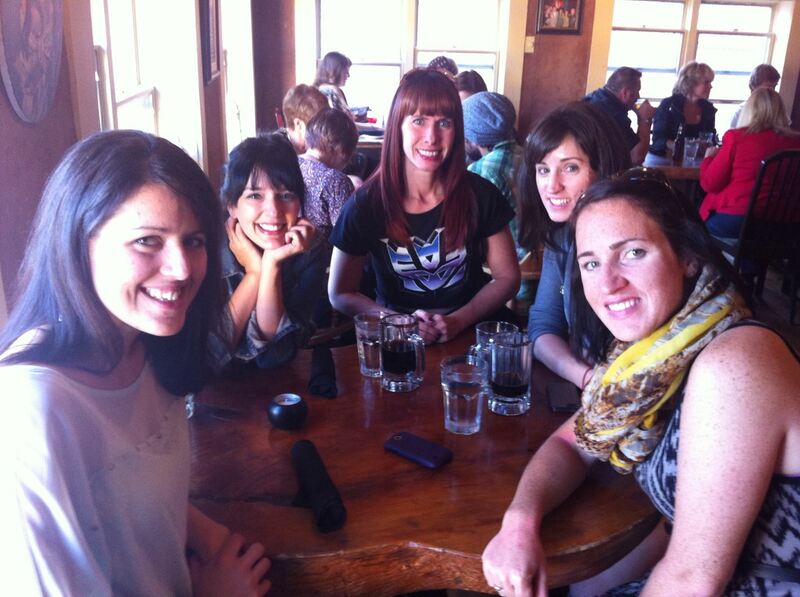 We hit up Lululemon, a few other stores, and then dined at the Wooden Monkey. 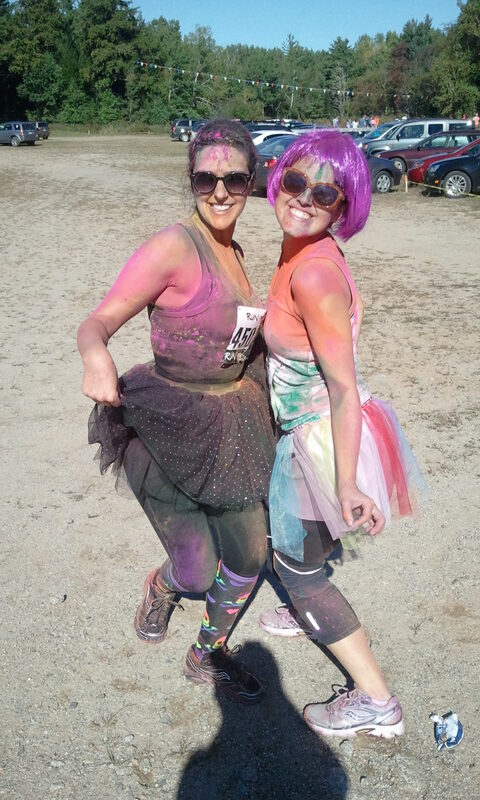 Overall, an excellent girls weekend, and a running experience I won’t soon forget. There are a fews ways you know it’s spring. 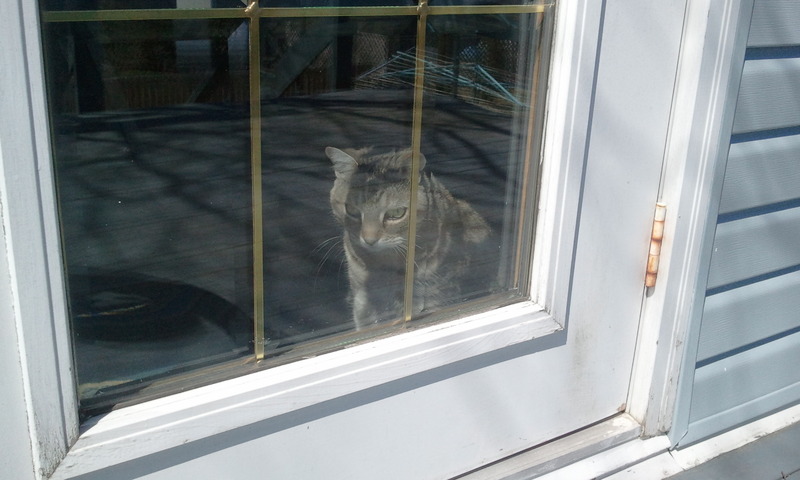 The birds are chirping, the bulbs spring through the soil, the kitty leaps (or saunters, shuffles, belly swaying) from window to window checking out the backyard wildlife. And, perhaps most lovely of all, you get that perfect running weather that you’ve been waiting for all year. The sun is warm, but the air is still a little cool. Warm enough to wear running shorts, but cool enough to wear a long sleeve tech shirt for a long run without profuse sweating. Ah, these are the days. This is why most marathons happen in the spring or fall. 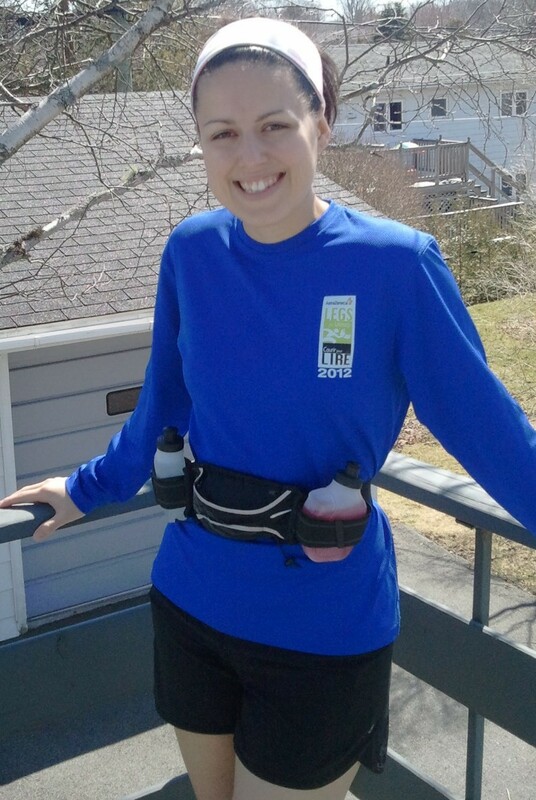 On Sunday I was a little nervous and tentative as I prepared for my last long run before the Fredericton half-marathon on May 12. I missed my last two scheduled long runs because I was sick, then away in Jamaica. I did little physical activity during those two weeks. Last week I did get back into the swing of things quickly, with two bootcamp classes, a short 4K, a speedy 3K, and an 8K. But the week left me feeling tired, sore, achy. Luckily, a Saturday rest day got me back to normal by Sunday. I slept till 9:30 or so then ate my pre-run go-to: toast with natural peanut butter and honey. I also had a banana sliced up with raspberries and a cup of coffee. I filled one of my fuel belt bottles with Gatorade (full cal) and one with water. 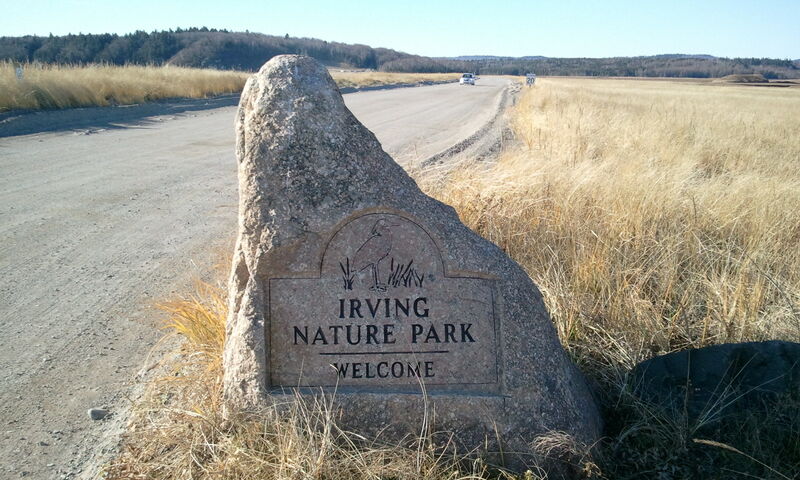 I packed along two Fig Newtons, charged up my Garmin and my iPod and headed for the Irving Nature Park. It was my first run there of the year. At first I thought I would start running at the park then head out, but during the run I decided to stay within the park and do three loops. Two loops were about 6.5 K and the last one was just over 5 K. I ended up with a perfect 18 K, which was exactly what I was aiming for. I struck out on a slow, steady pace. I wanted to make sure I could make it to the end. The park is fairly hilly but the hills felt doable. I had my first sip of water at about 5K and started nibbling after the first loop, just a bite every couple of km. I find that any more than a bite is hard for my stomach to digest. The last loop was definitely hard. But I knew I could do it. By the end, my legs felt almost robotic. It was a good feeling to finish, knowing that despite my rotten cold and my vacation, I don’t think I lost too much fitness. Knock on wood, things are looking good for Fredericton on May 12. My bf and I love to explore new places – especially when they are in our own beautiful region. Cape Spencer has been on my list of places to check out for so long. 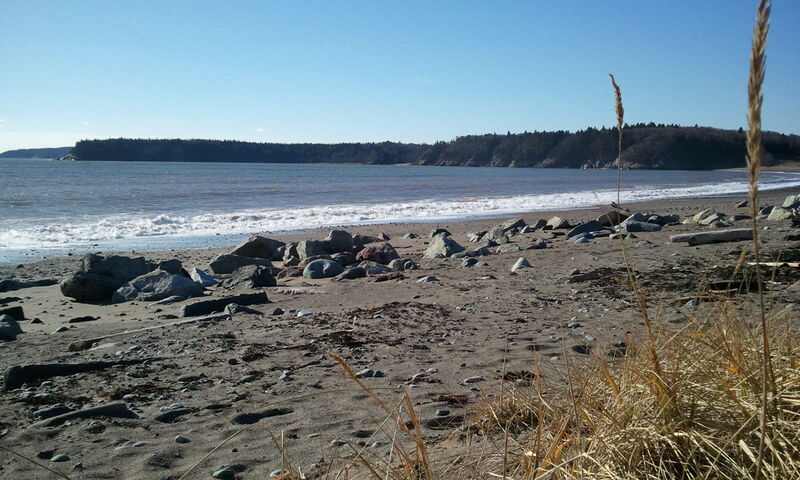 Cape Spencer is on the rocky shores of the Bay of Fundy just east of Saint John’s city limits. Take Red Head Road all the way to the end. The drive through the community of Red Head is beautiful. On Wednesday we still had no snow, but it was cold. So we were able to get out and explore the area around the Cape Spencer lighthouse, which was built in 1983. A lighthouse has existed in that location, on a steep cliff overlooking the bay, since 1873. Just around the corner from the rocky land (above) is the imposing Canaport LNG terminal and Mispec Beach, which has been stricken with a lack of funding due to Saint John city budget cuts. Storm erosion has caused some damage at the once-popular beach but the city is looking at getting disaster relief funding to pay for some repairs. Cape Spencer is blissfully out of sight from industry. We could see a fishing boat, tiny in the distance, out in the frigid yet peaceful bay waters. We imagined how lovely and exciting it would be to explore these coves by kayak. A giant boulder in the water makes you feel so small. My bf says in the summers, teens will climb the rock and there is a place to lay out and catch some rays. A short goat-path leads to toward a steep cliff. The air is fresh and exhilarating. I’ve heard the fog horn on the lighthouse can be quite startling… so don’t stand too close to the edge! After seeing the cape, we ventured back to Mispec, walked along the cold beach and climbed the rocks to get a view of a quaint little fishing wharf. We walked a short trail, the cold, snowless ground crunching underfoot, before heading home. The first sub-zero run of the season is always a little daunting. I wake up thinking, if my fingers and toes are nearly numb inside, how are they going to feel outside? No matter how many time I run in the cold, I’m always amazed at how quickly the body adjusts. With the day off, I had the luxury of waking up, eating a nice breakfast and giving myself time to digest before yesterday’s run. For me, that is key. 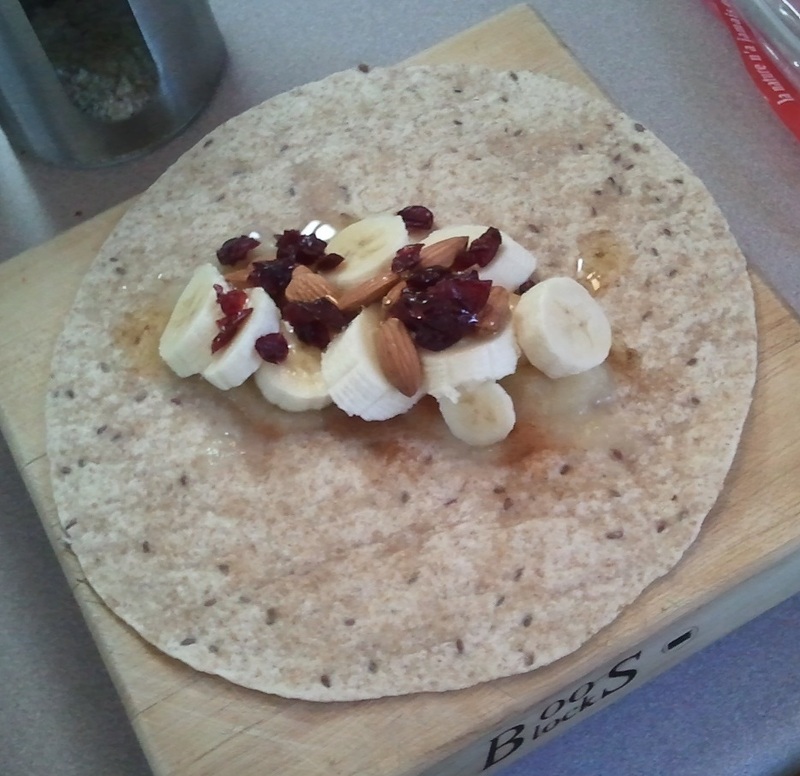 With an uncharacteristic lack of peanut butter in the house, I opted for a banana, apple sauce, nut and honey wrap. Yum! I kept checking the outdoor thermometer, hoping the temperature would creep up a bit. It said -10C! But when I checked the Weather Network, it said -1C, and -8C with the windchill. So I geared up with my long running pants, pink Swiftly shirt and Full Tilt pullover. The pullover has built in mittens (cuffins!) which I love. 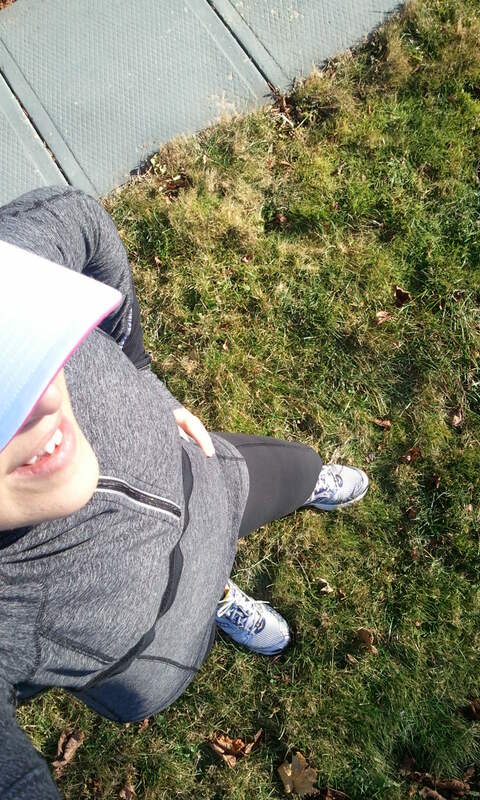 Since I don’t have a proper running hat or warm head band, I wore my summer running hat hoping it would keep me warm. My fingers even froze taking this photo. I was nervous for the cold run ahead. Since it was such a sunny day and I had the time, I took a short drive to the Irving Nature Park, my favourite place to run in Saint John. 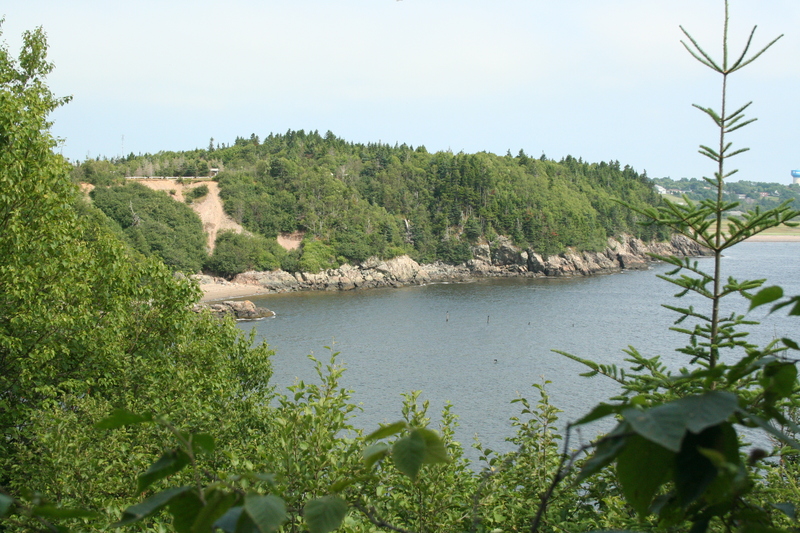 The nature park is on a peninsula jutting out into the Bay of Fundy. The park’s gravel road is protected from the wind. As I started the run, it didn’t take long to warm up. I was worried that what I had on wasn’t enough. I’ve never owned a third running layer (like a jacket) but I do have a vest I sometimes wear when it’s really cold. I kept the cuffins on for the first bit but not for long. At first my legs felt chilly, but they warmed up too. The coldest parts of my body were my toes and my cheeks. But you can’t do much about that (except, maybe warmer socks?). Really the things I wished I had the most were tissues and lip chap. My body warmed up quickly and I even worked up a sweat by the end. Running in the cold is nice because the heat doesn’t zap your energy. I find that running hills is easier and I could have run much farther if I wasn’t such a chicken from the get-go. I did run into some trouble by the end with some pain in my left knee. Nothing a date with the foam roller can’t fix. So, here’s to cold-weather running. When you think you’re going to freeze your buns off, you probably won’t! For some reason, I had an eerie feeling that something would go wrong when my bf and I planned a day-long hike along the rugged Fundy Footpath – the extension of the popular and easier Fundy Trail that runs along the seaside parkway east of St. Martins. I thought we might get stuck somewhere and run out of food. So we brought more than enough snacks, sandwiches, granola bars, Gatorade and water. 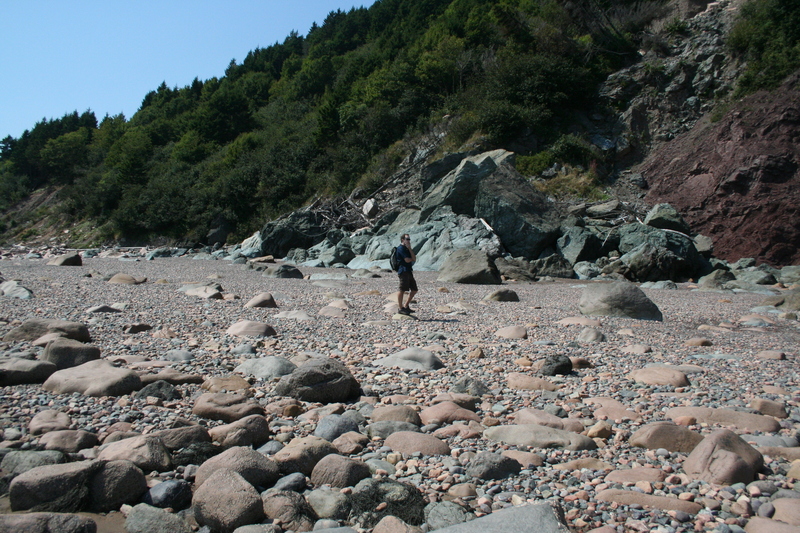 As we trudged through the dense forest, which hugs the cliffs along the Bay of Fundy, everything felt right. The air was fresh and the sun was warm. It felt like we were making the most of one of our last summer weekends. We planned to just hike as far as we reasonably could – hoping for Seely’s Beach, which is about 8 km away from the start at Big Salmon River. Not more than 20 minutes in, I looked down and felt a strange twinge at my ankles. At first I thought I twisted something. Then I felt pain. A lot of pain. And then I saw a hornet stuck in the meat of my calf, exposed just below the knee. And another one in my ankle. I freaked and ran off down the path, tears streaming down my face. Luckily, my hiking buddy knew what to do – quickly scraping the insects and their stingers off my leg with a stick. I paused and wiped my eyes. I couldn’t believe the stinging pain. And I couldn’t believe in all my worried packing, I didn’t pack a single first aid supply (doh!). Well I didn’t want to let a few hornets ruin our day. I don’t have any allergies, so I thought I would be fine. We continued on, taking in breathtaking views, climbing steep goat paths and passing outback campsites. 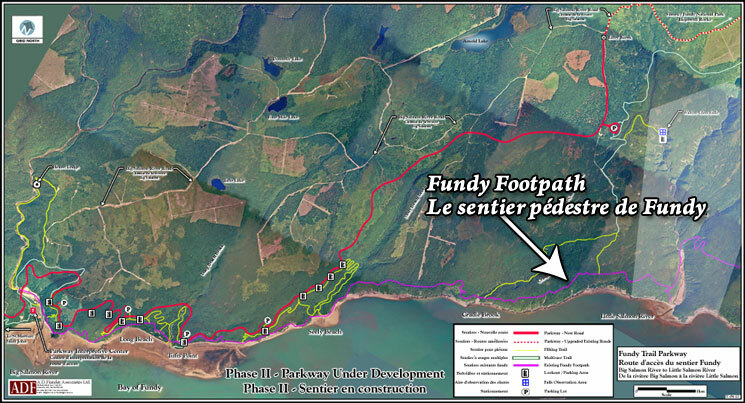 We really got a taste for what the full Fundy Footpath hike (40+ km, which would take three to four days) would be like. Finally we ended at a beach and ate our giant lunch. (It didn’t soothe the hornet stings). After a full two hours of hiking, we thought we may have made it to Seely’s Beach. But alas, it was only Long Beach – only 4.3 km in. It’s amazing how long it takes to trudge through dense bush, up and down hills and cliffs. The Fundy Footpath follows the blue line. After all of that work, and as I was feeling exhausted from my injury, we kind of cheated and walked the shoreline back to Big Salmon River at low tide. But what a treat. Long Beach was flat, beautiful sand. Then we hopped from rock to rock, and then continued over a very stoney beach. The rocky cliff faces were breathtaking, seen from a unique perspective. We barely saw one-eighth of the entire footpath, and after one full afternoon, we understood both the appeal – and challenge – that hiking the last piece of undeveloped shoreline along the Eastern Seaboard would bring. It’s one of those days when you step outside and smell the salt in the air. The sky is heavy with fog, and it’s about 18 C. Perfect for a run. After eating a banana and drinking a glass of water, I took a short drive to the Irving Nature Park, and parked at Saints Rest Beach. The run including the beach and the gravel road loop is about 8.5 K. I turned on my music and ran along the beach. The fog was so thick, I couldn’t see the Bay of Fundy to my left. Beads of dewy fog started to form on my skin, my hair, my brows and lashes. So damp, but cool and refreshing. I kept running and powered up the first hill. I told myself I could take a little walking break after three songs. After the third song, I felt great. Not a bit of fatigue, in fact. So I didn’t stop. And amazingly, that strong, calm feeling lasted throughout the run. I somehow found that elusive, perfect place where you’re comfortable, yet exhilarated. Heart beat strong and steady, breath smooth. Music pumping, legs moving in a rhythm. This was my best run in a while. And after my rough time last weekend, I needed that confidence boost. I finished the run in about 51 minutes, at a pace of 5:54/km. Not bad, considering my fasted pace has been 5:30/km. So this is what tapering is all about. This was my third relatively short run this week, with one more to go on Sunday. A couple more next week, then it’s time to rock the half-marathon. Bring it! Until then, keep checking back. Starting Tuesday, I’ll have some expert advice on nutrition for runners, and I have a few other ideas up my sleeve. Sand. Ocean. Sun. Fresh air. 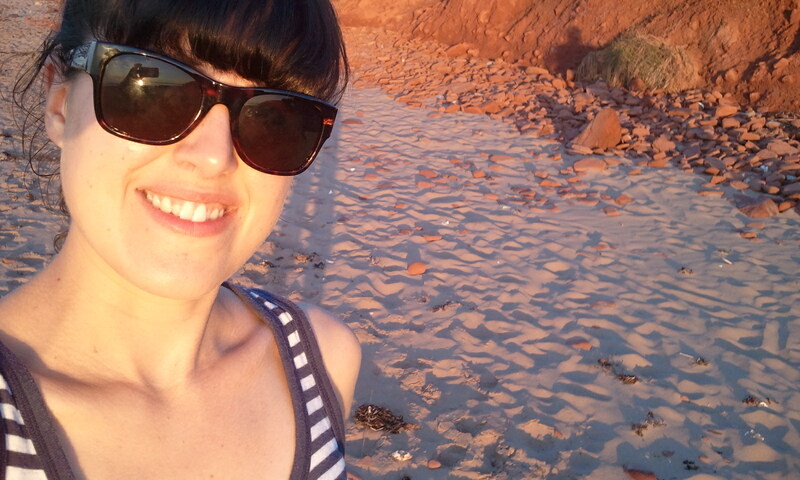 Cavendish Beach is a haven for relaxation, warmth and feeling the ocean breeze. When the weather is good – as it has been – it is also so great for camping. There is nothing quite like reading a good book, stretched out on the hot sand, then jumping into the salty ocean for cool relief. 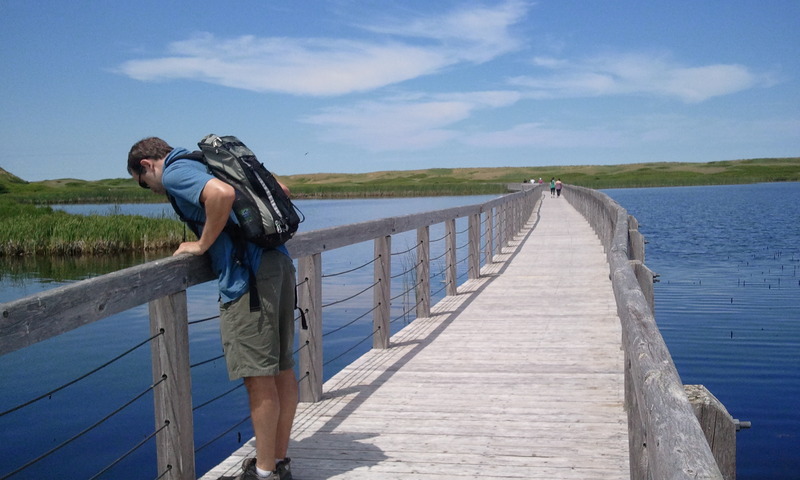 Greenwich is a hidden jewel in PEI National Park. Near St. Peters on the north shore, a 30-minute hike through a historic homestead takes you to a protected marshland where you’ll probably see beavers building dams, or colourful birds catching insects in the air. At the end of a hot walk, and a hike up a steep sand dune, we were rewarded with a breathtaking, serene beach. If only we had brought our swimming gear. 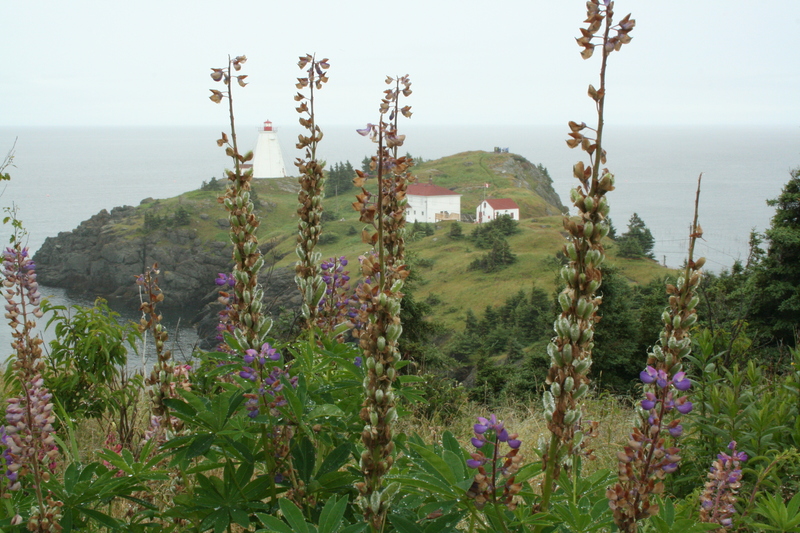 After three years of living in New Brunswick, I recently made it to Grand Manan island, a sleepy place steeped in fog and history. Here, fishermen circle the island, gathering their lobster traps as you snap photos of paint-chipped lighthouses – some with working fog horns that might scare you off the side of a craggy cliff. This place is a real Maritime treasure, and I can’t wait to go back and spend more time camping, hiking and perhaps biking or kayaking. 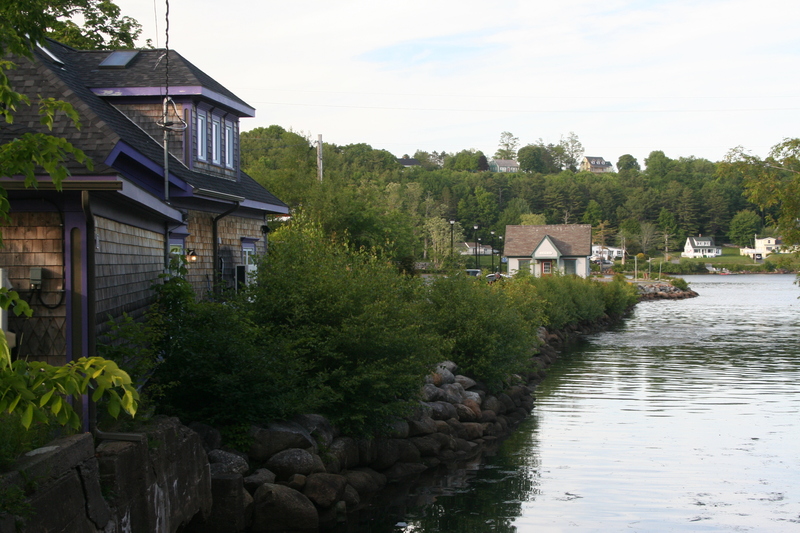 During a five-day trip to Nova Scotia’s south shore, my boyfriend and I meandered along the shores of Mahone Bay. We ate amazing seafood chowder at the Seaside Shanty in Chester Basin, we cycled and old rail trail from Chester to the village of Mahone Bay, and we strolled the UNESCO-preserved streets of Lunenberg, a town filled with more bright colours than you’d find in a Smarties box. There is so much to do in our lovely part of the country. We both feel like we could use all of our time off to keep touring locally and finding more adventures close to home.